Fly-fishing and solitude. A spectacular week with the Rogers family. Steve and Chris Hammer, Feike Postma and John Loudon. The first anglers of the year on the Middle Fork. 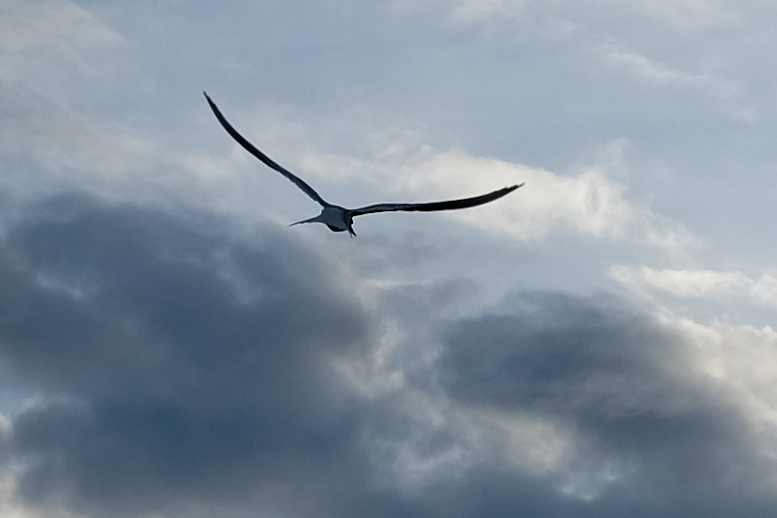 From the trip log of July 10’Th, 2015: We flew outbound in the floatplanes with our rafts, camping gear, and fly rods. Each of us very excited to be underway. 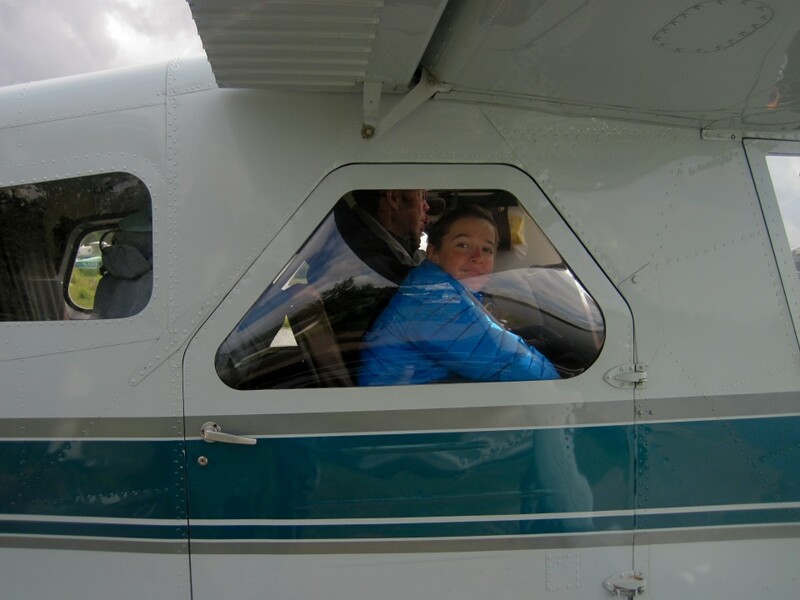 It was a lovely day to fly with moose and sow Brown Bear with cubs seen from the air and with the beauty of Kukaktlim Lake where our plane dropped us off. 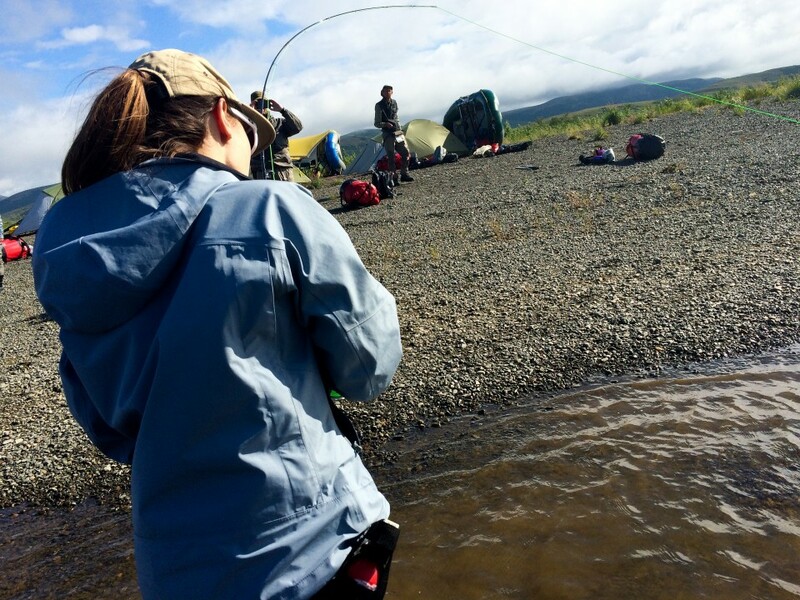 The guides inflated rafts and stowed the gear while anglers rigged rods, explored the lakeside, and took in the beauty of the setting in the volcanic cones of the Ahklun Mountains. The last floatplane departed and we were alone. In my boat Josie and her daughter Juliana were all eyes and ears as we pulled away from the shoreline. A Red Fox made an appearance just yards away then crested the adjacent ridge while the river current tugged the boats and we started downriver. I knew I was lucky to have the two Roger’s women in my boat! 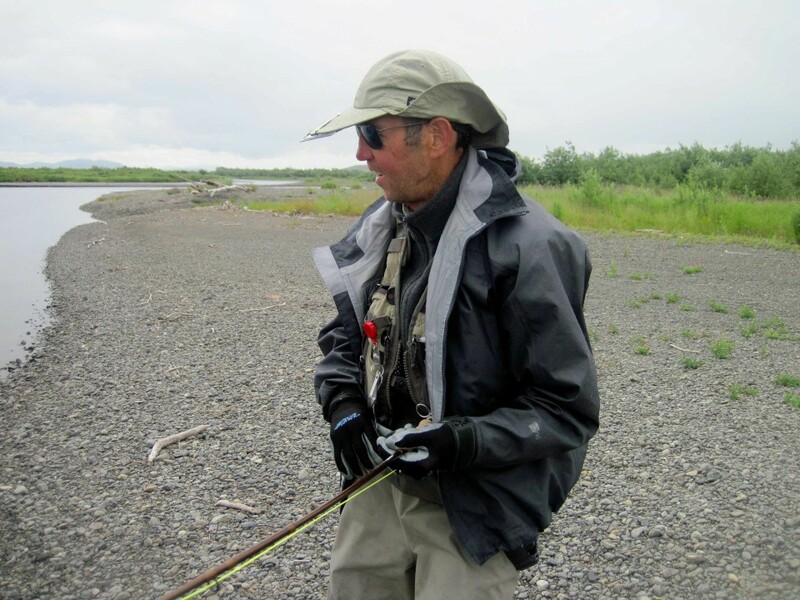 It is my everlasting good fortune to be able to introduce guests to the Alaskan landscape and when conditions are fine as they were for us, it is magic! 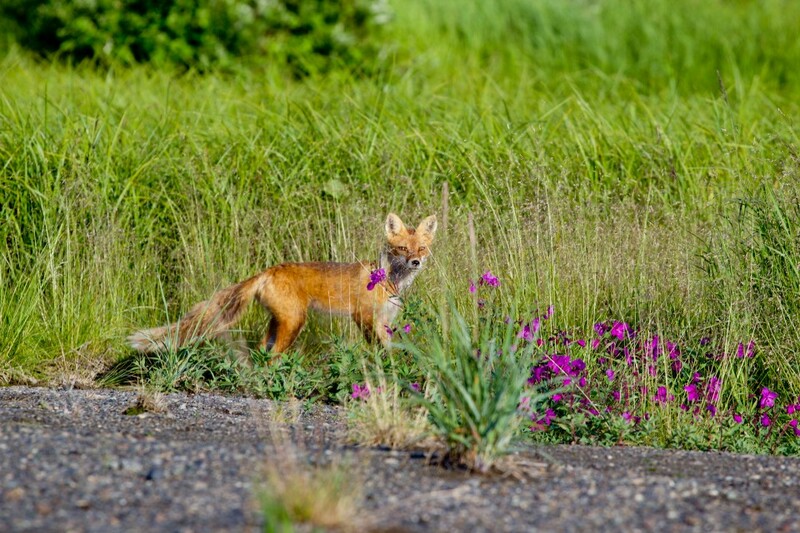 The wildlife was novel, and the wildflowers were ablaze in the early summer evening light. We were passing through an alpine landscape with cliffs, and mountain peaks and the riverbanks were alive with birdcalls. Those hours were near perfect. The Brown Bears were fishing in a riffle just below the lake outlet where over the years we’ve consistently seen bear activity. 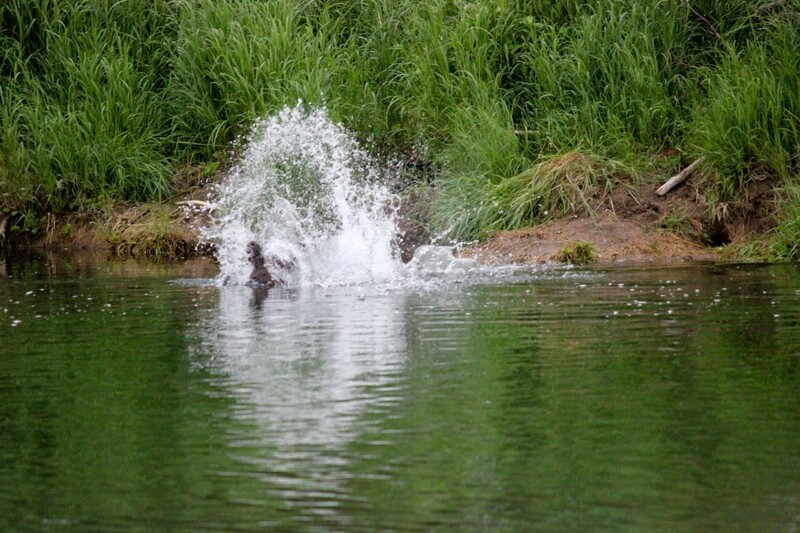 The bears fish the riffles by spotting salmon and chasing them across the shallow flats, spray flying. This afternoon they moved away from us uphill into cover. Across these same riffles we oarsmen struggled across shoals among awkward channel choices while anglers cast at pockets of resident Trout & Grayling in the very, very skinny water. The headwaters of all the Togiak Wildlife Refuge rivers were low in 2015. We fished and travelled for 4 hours until we found a fine camp on a gravel bar with great views of the mountains and river valley. I’d forgotten how scenic the rock formations above the river are. We passed below rocky escarpments marveling at cliff shapes and at the orange and green lichens adhered to the rock. 2 Immature Ravens sat bluff top and naively watched us pass. Mother ducks protected their broods by luring us away with a broken wing routine. The sandbars were pocked with Caribou tracks. We enjoyed the landscape as it scrolled past. Jim took a nice Rainbow and a couple of notable Grayling. Steve and Chris took a handful of Rainbow trout and Grayling too. 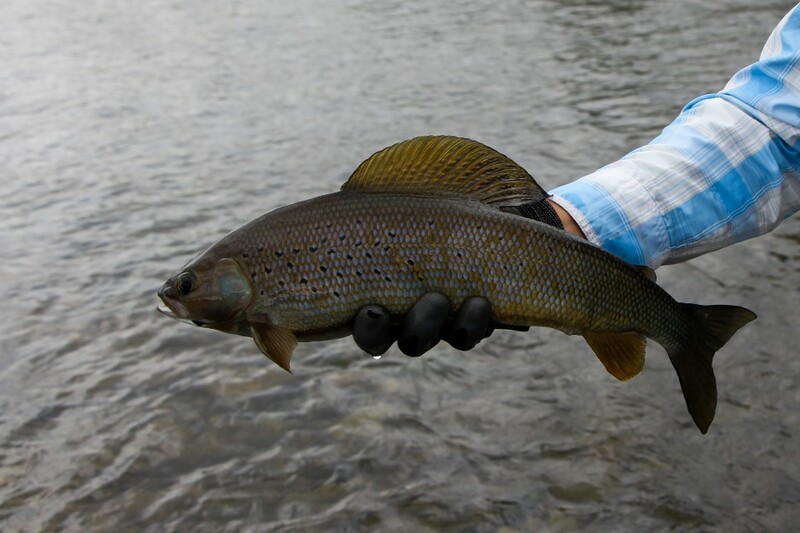 Feike & John took Grayling consistently on dry flies. 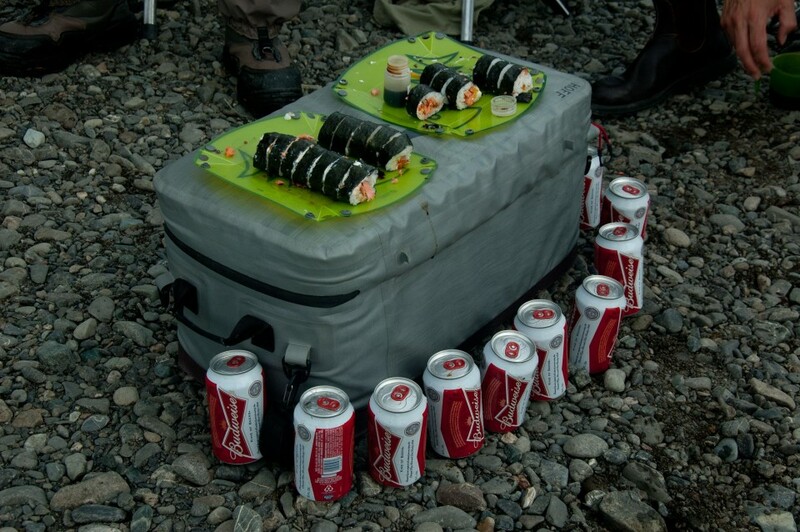 The first day’s journal entry ends with “After an afternoon of fishing and rafting we had a big pasta & Sockeye dinner. 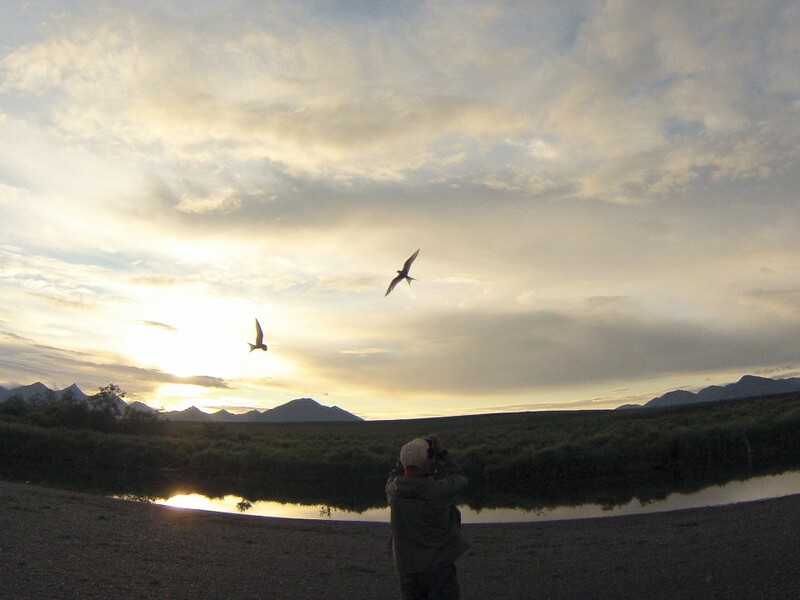 We followed that with another fly fishing session until near midnight.” Guests and guides turned in to the tents late under the midnight sun. On day two we pushed downriver fishing and travelling through the alpine tundra landscape. 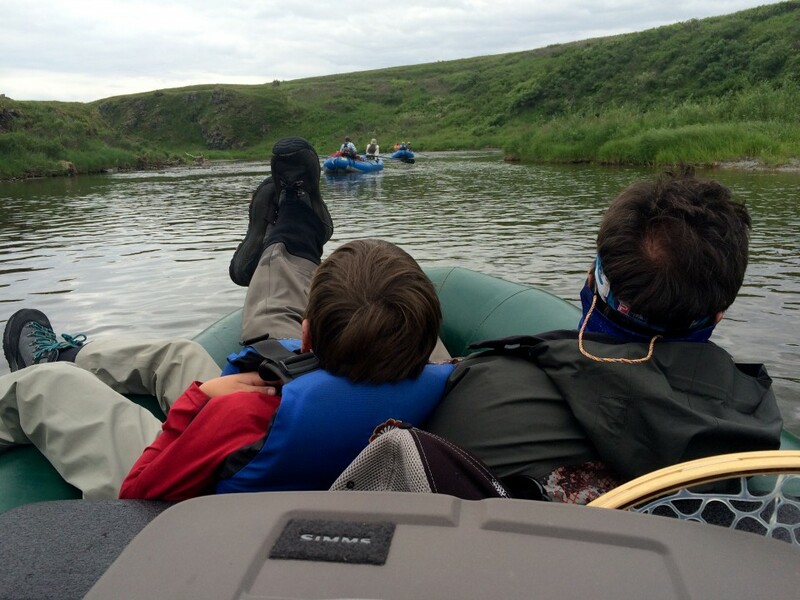 I fished and floated with Jim and his son James and enjoyed their father son bond. 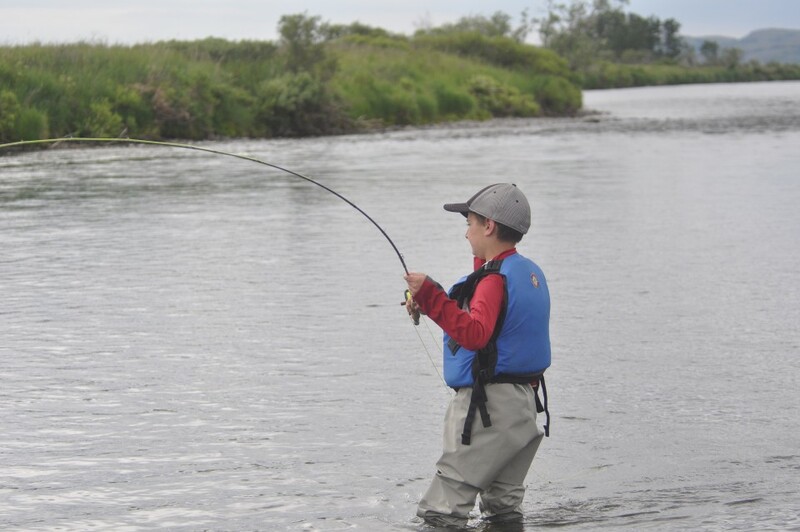 Like his father, James has a passion for fly-fishing! They cast and retrieved, they critiqued each other, and they netted for one another. They commented on the fish taken and released. I looked around and saw the other rafts likewise scouting for fish, hooking up, and taking photographs. Each of the rafts took enough Arctic Grayling and Rainbow Trout to keep it thrilling. By days end Jim & James had released nearly 20 Grayling, a handful of leopard spotted Rainbows, and 5-dime bright Dolly Varden. 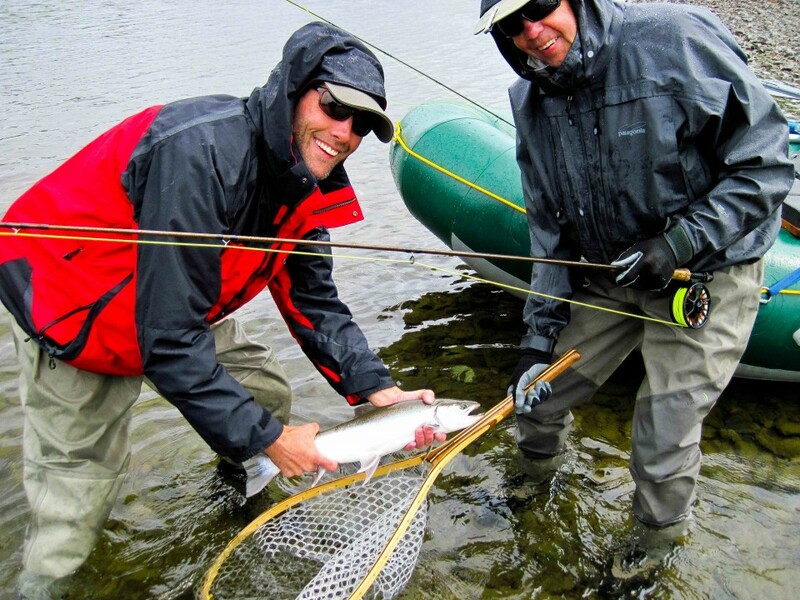 Other rafts had similar success and some released King and Sockeye Salmon as well. The fly patterns that produced the highest numbers of fish were trout bead /egg imitations. For the larger fish, streamers took the trophies. Each boat averaged several dozen fish released this day. John & Feike found a pool mid day with a great school of salmon staged as if waiting for them. It was comprised of Sockeye, Chum, and King in that order of abundance. Holding below and behind the salmon were some very extraordinary Char. John was casting the big streamers that he favored. 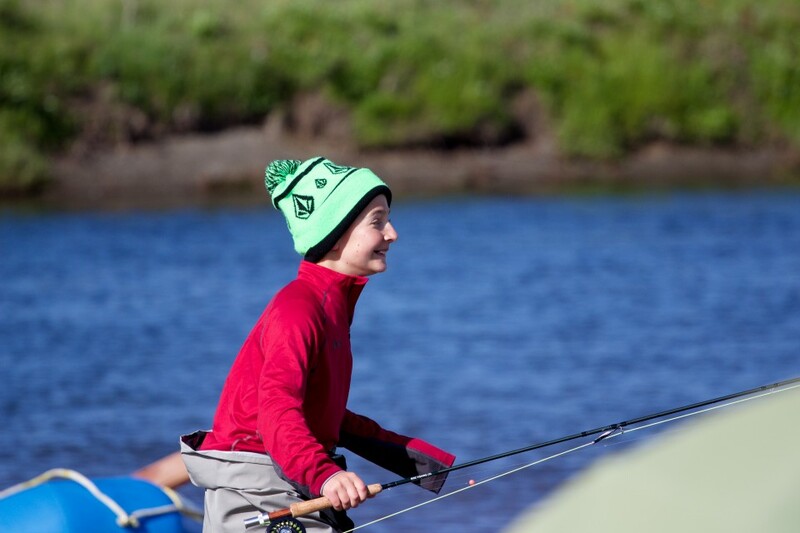 As our raft passed by he hooked an arm length Dolly Varden Char that I’m sure he’ll remember for his entire lifetime. It was truly a spectacular fish and he radiated the most amazing smile as he focused on getting the grand fish to the net. That Char was developing the characteristic hooked jaw of the adult male. It had creamy white pectoral fins but was otherwise olive backed with pink spots on chrome silver sides. It was fresh from the salt and as large as any Sockeye Salmon. It was magnificent. The headwaters of the Kukaktlim Fork like all Bristol Bay rivers has a relatively steep gradient, and shallow while the river forces it’s way through the relic gravels of ancient glacial moraines. 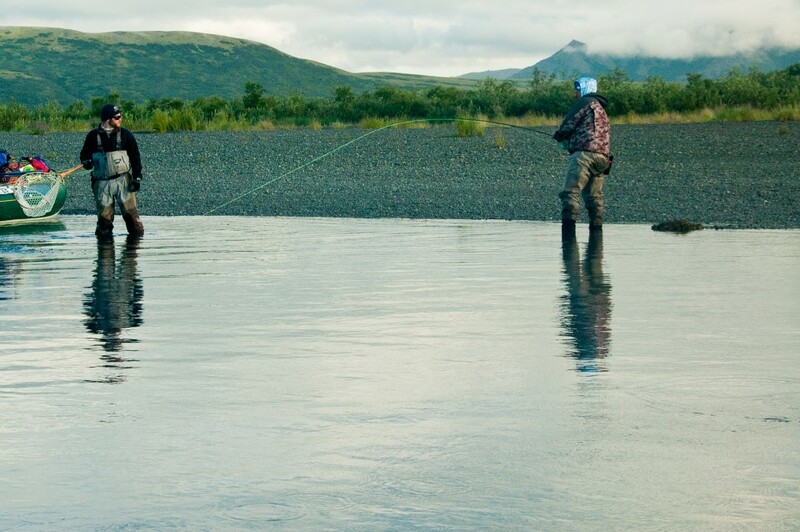 For the angler the headwaters have a paucity of deeper holding water and little or no woody debris for cover. The upper reaches are nutrient deprived with neither little streamside vegetative biomass nor much animal biomass and so we must travel through them until the gradient tapers off and where sinuous river meanders develop and then a more robust fishery develops. However, and this is the big caveat, the upper one third of the river is the trophy Grayling fishery and holds enough large rainbows to be worth the effort. Raft based fly fishing must be choreographed to be efficient at moving through the upper river while sampling the Grayling and Rainbow trout fishery and then slow down to loiter in the mid river sweet spot of fishery abundance, and finally to pass into the low river salmon water. From the log came this observation: “All 4 rafts took double digit numbers of Grayling, Trout, & Char while it made no difference whether anglers were in the lead boat or bringing up the rear in boat number four”. That reflects the strength of the fishery and the lack of angling pressure that even in gin clear / low water conditions the fish weren’t spooked or put down by the passage of the rafts. We passed a bull Caribou and later had a sighting of a fast trotting cow Moose who was “eating up the landscape” with her long legs racing toward the east. She was in a major hurry to put some miles behind her, yet gave no indication that she was aware of us. We hadn’t spooked her. One had to consider whether she’d been the object of a Wolf pack or Brown Bear’s unwelcome attention? We passed down the river considering what we observed in the tundra and perhaps comparing it with the lives we lead at home. Fishing in Pete’s boat Josie and Juliana had a fine day. In the planning stages Josie told me that she wanted to be here to share the family adventure and like Juliana she was a bit ambivalent about the fly-fishing. 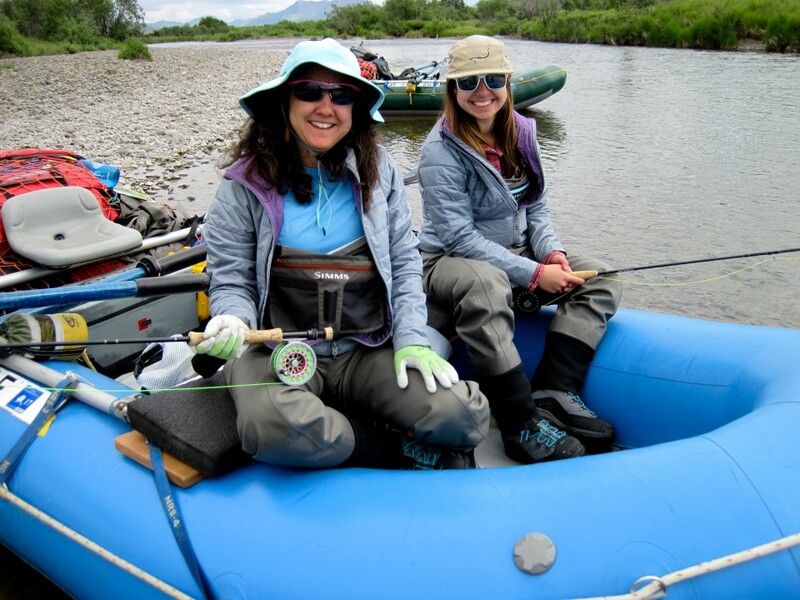 But then as the miles of spectacular tundra scenery passed Josie and Juliana worked on their casts and the magic of the Wilderness fishery worked on them. Their casts grew more confident, their flies stayed in the strike zone longer and the fish were willing! 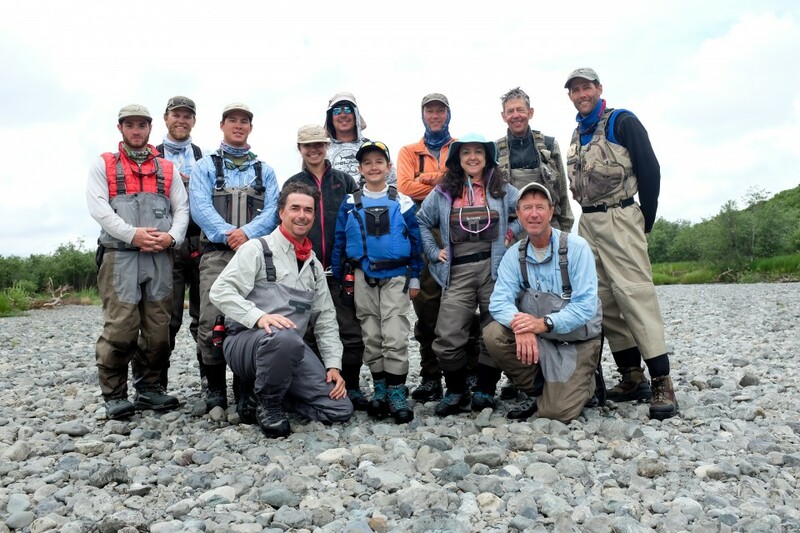 I saw some great smiles while fly rods were rods arched in their boat… and this was only day 2. Chris Hammer killed a fine Sea Run Dolly for supper. The Char fillets were rich with ocean-derived fats and the flesh was lush pink-orange color from the months it spent feeding on Smelt, Capelin, and Sandlance in Goodnews Bay. The bay, estuarine, and ocean nutrients contributed the orange and pink Keratins that color the flesh. A nice cheerful dinner party ensued under near perfect evening weather. We had a bit of a breeze/ so no insects. A fine dinner. A nice glass of wine. Life was sweet. In the later evening, half the group climbed the bluff above camp for the expansive view. 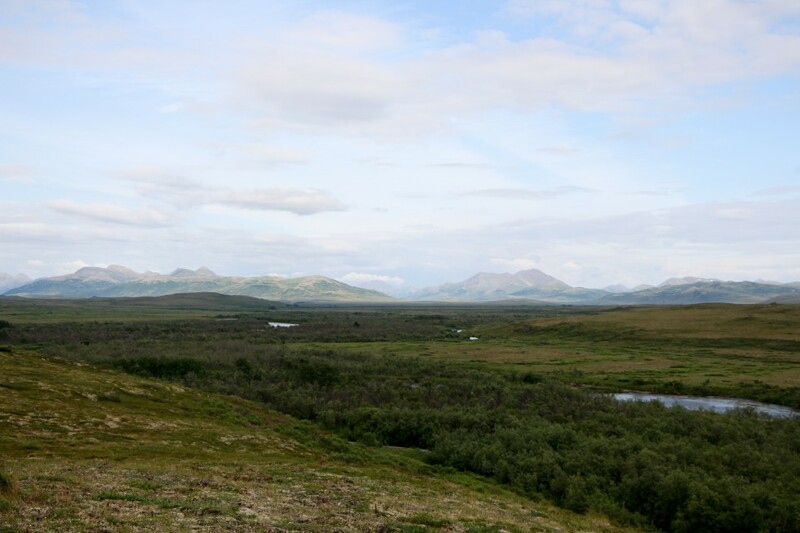 They got the view in spades and reported good sightings of an uncommon bird, the Longtailed Jaeger, a predatory arctic bird that breeds in tundra landscapes like this. 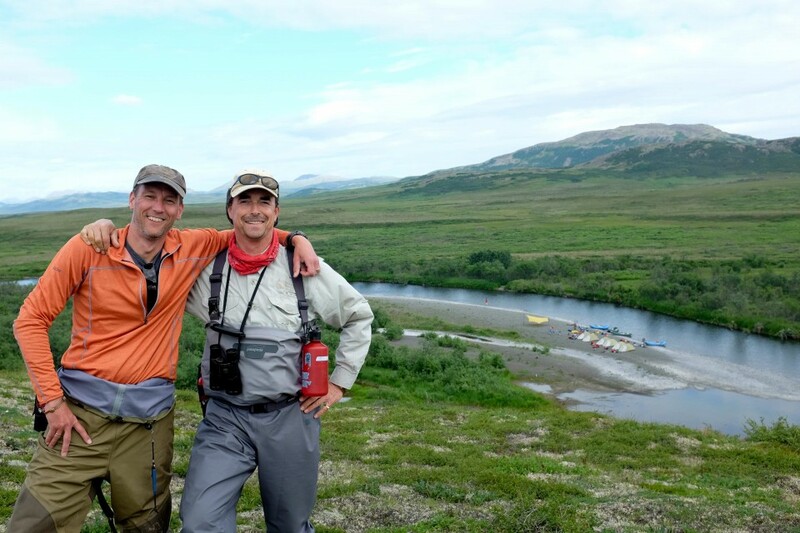 From the log of Day 3, July 12’Th, 2015: “Dr Steve Hammer & Chris Hammer began searching with streamers as pocket water and channels presented targets right out of camp. 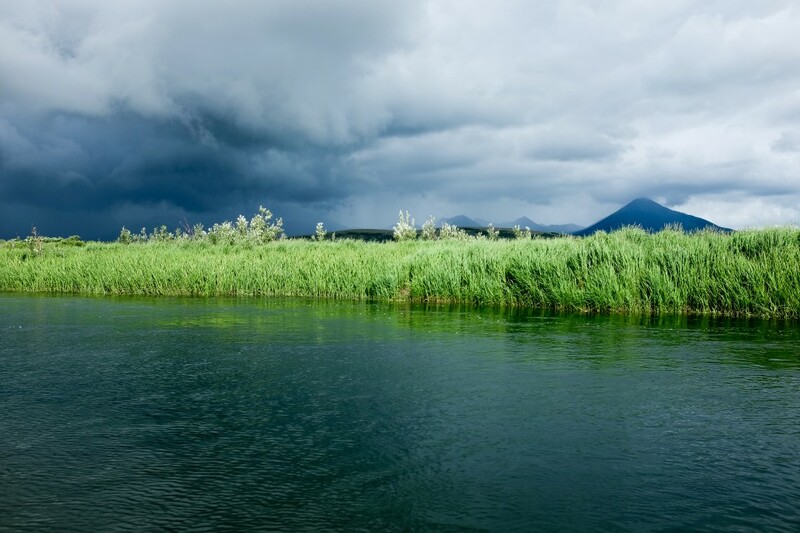 Over the course of the morning they took great Char and Rainbows” and then the fishing fell off midday as gusty winds were followed by rain showers. Jacket hoods then were cinched tight and they continued fishing. 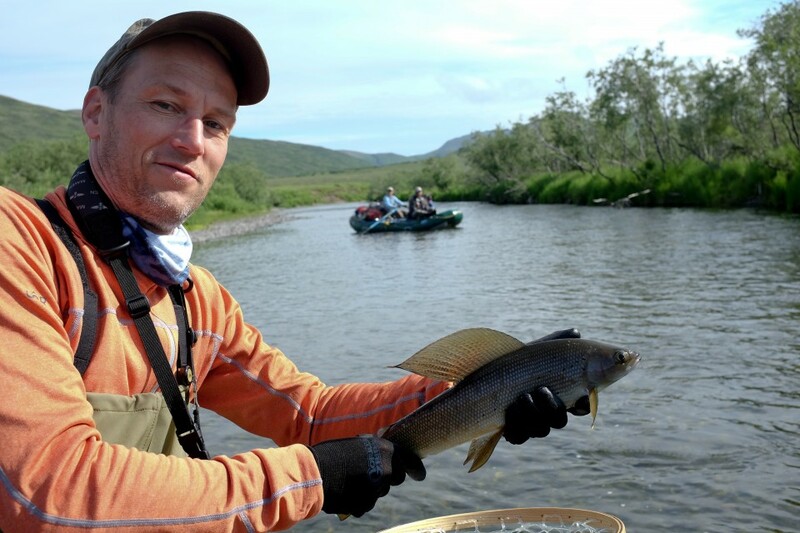 The fishing in mid river changed from a fishery dominated by Arctic Grayling and Rainbow to one dominated by bold, bright, Sea Run Dollies and Rainbows with small pods of Sockeyes. The 2015 salmon run began! 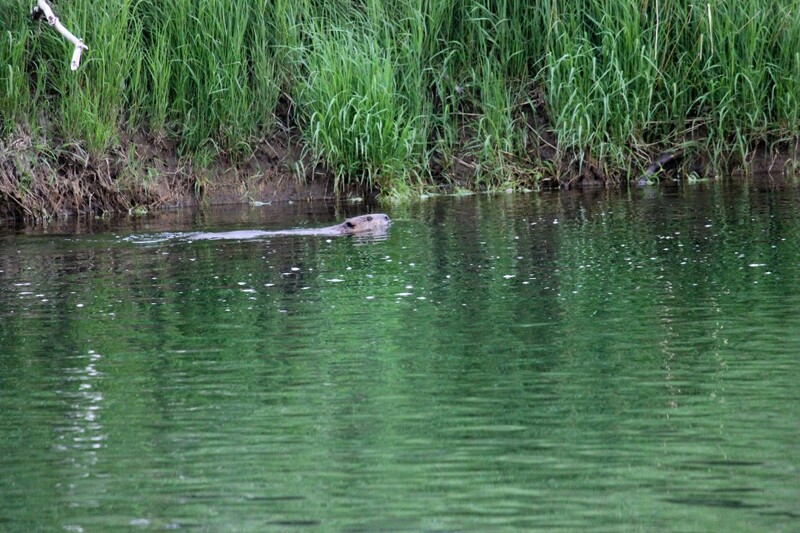 Wildlife sightings in the mid and lower river shifted from occasional sightings of big game like moose and caribou to birdlife and smaller mammals like Beaver & Mink & Fox. In part this is a function of geography and in part of wildlife population density. 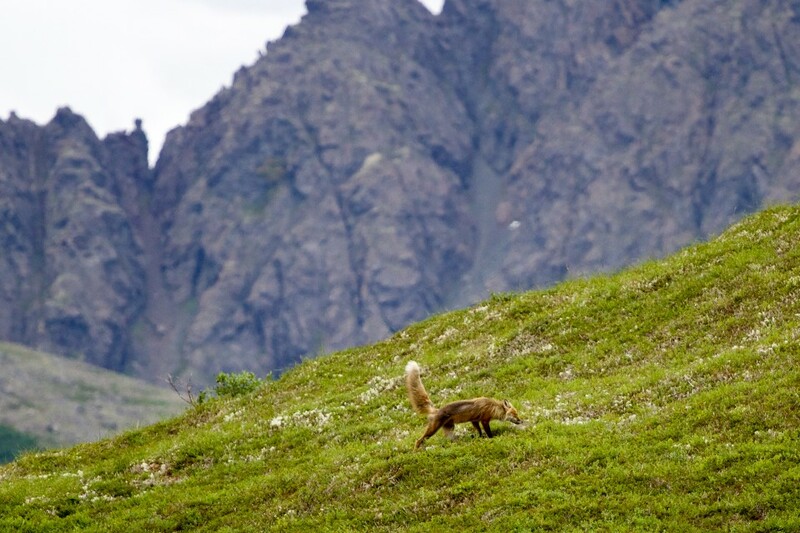 In the headwaters the valley is narrower and the large mammalian wildlife is much easier to spot on the hillsides adjacent to the river. As the valley broadens we are less able to see through the riverine willows to spot wildlife on the flatter ground unless we climb the hillsides and look down into the valley floor. 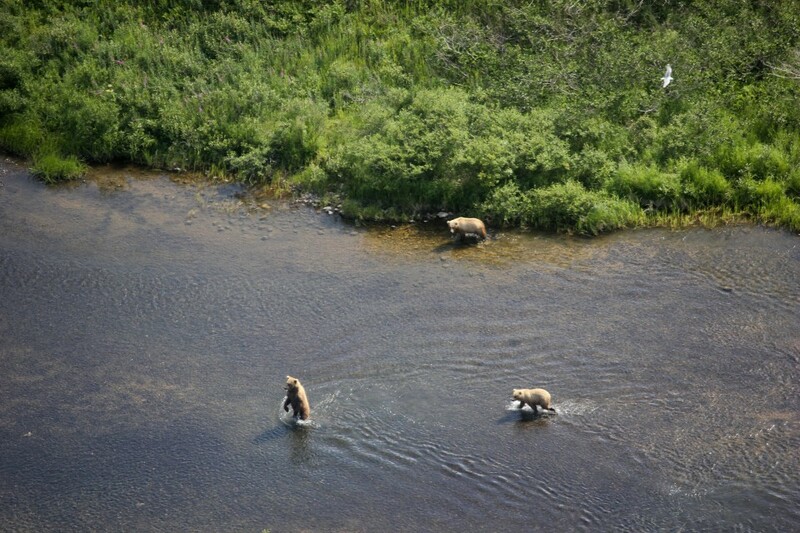 Geography enhances bear and caribou sightings in the headwaters / alpine environment yet the mid-river geography favors the angler where trout hold near the root-wads and salmon rest in the pools. 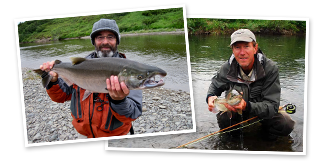 From the trip log of Day 4, July 13’Th, 2015: If I were to choose my most memorable afternoon it was with James and Juliana on day 4 when they began to rack up success with big shouldered Dolly Varden. Admittedly their guide, me- didn’t do well putting them onto fish in the morning but in the afternoon the fish gods smiled on us. 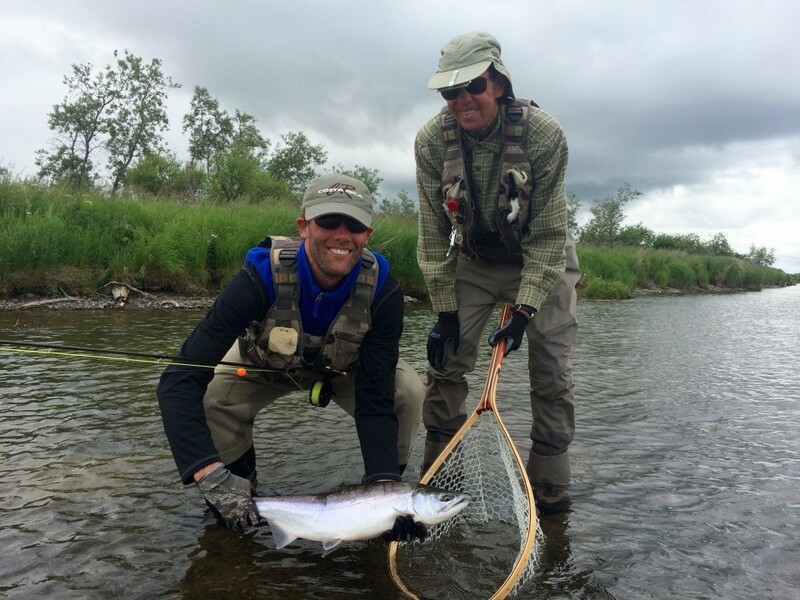 The guide managed to find fish, both anglers “were on fire”, and we netted some terrific fish. After that afternoon they individually built on their success hour upon hour for the rest of the trip. Rafting downriver the fishing stayed strong through the mid river and then tapered off in the low water levels with high water temperatures of the lower river. Our catch rate fell off. The data show that bulk of the migrant Char was centered in the 2 dozen miles below the confluence with the true Middle Fork. From the trip log of July 11, 2015: ” In the zone where the Kukaktlim Fork is joined by the true Middle Fork the river begins to develop more channel structure and some long sweeping bends are overhung with Willow and Cottonwood and tangled undercut root-wads collapse into the river. The woody debris creates Rainbow Trout cover and also salmon fry rearing habitat and the fishery becomes substantially more diverse. Guides Brian & John steamed the rice, lightly steamed the Sockeye, then rolled Sushi. Sushi on the river is such a treat. As you know the fish must be perfect. Sushi, the way we serve it is to celebrate the fish. 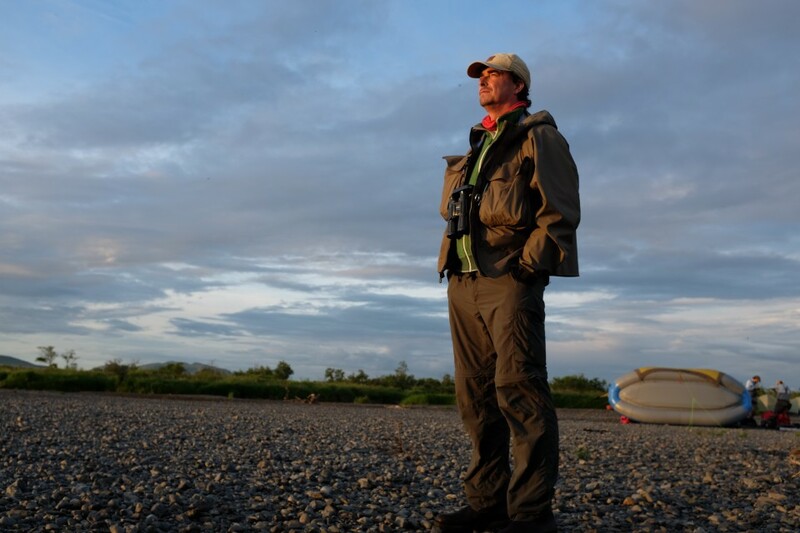 The experience of a full week on the river deepens one’s understanding of the fish and wildlife and also of one’s connection to the planet. From time to time we talked of the challenges facing the planet and I must be frank. There were long pauses as we considered the possible outcomes. The river current in the lower river slowed and developed huge meanders and ox-bows, with backwater sloughs. These last dozen miles to the takeout are without strong current. How does the lower river fish? 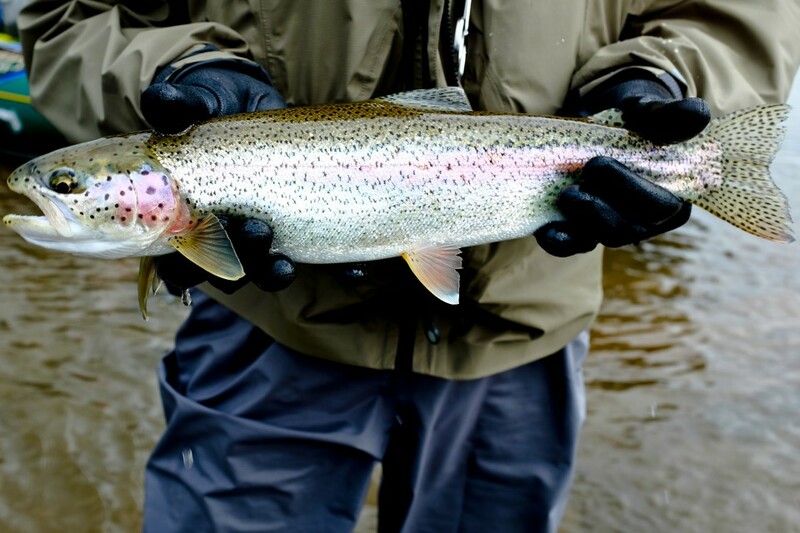 Paradoxically the largest Rainbow Trout are caught here on streamers, slowly stripped. Also anytime there is a push of salmon it’s worth your time to cast. Just ask Chris Hammer who fished hard right up until the floatplane arrived at takeout! He said he had the best day of the trip at takeout! We watched the river recede behind us when we climbed in the airplane, took off, and returned to civilization. Did we really leave the middle fork behind? Isn’t the river right where we left it awaiting our return.